Mariah Carey has broken free! She's in total control of her career, and it shows. With this new album, with the interview in the November '98 Vibe magazine, there is an unrestrained expression of joy that's hard to miss in her music, and in her public life. I first saw Mariah in a video for her first single, "Vision of Love". She was also a musical guest around that time on "Saturday Night Live", and that's when I really got hooked. She showcased her gospel and soul influences in that, and in most live performances. I went right out and bought the CD. In that first album, "Love Takes Time" and one of my favorites, "I Don't Wanna Cry" also became hits. But one of the cuts from that album that did not get released as a single or video is the best of all of her songs. "Vanishing" is a song that is almost acappella; there's just a piano and some light background singing accompanying her. If you haven't paid much attention to that cut, play it sometime. 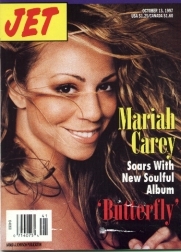 I think it shows the potential of the Mariah Carey that has gone on to be among the best female vocalists today. I like Whitney, and I like Patti, don't get me wrong. But like "Old Dirty" says..."me and Mariah, we go together like babies and pacifiyahs...." Some singers just do it for you, you know? It's well known that she used to be a background singer in the eighties for Brenda K. Starr, and when that fizzled, she was having a tough time trying to make a name for herself in the crowded music industry. Tommy Mottola is credited with giving her the big break that set her on the road to stardom. She later married him and the fairy tale was off and running. I don't know all the gossip, in fact I'd like to think I am above searching for it, but the general flow of her music was considered more pop than soul. She is bi-racial, and that fuels the "cafe-ole" debate in the Black community. It's silly that some have even brushed aside her music just because of her appearance. She has always embraced her African-American culture, and she speaks on this in the Vibe interview. In her private life, it was reported in circles that she was more or less sequestered on her husband's upstate New York estate/farm, a modern day Rapunzel. Can't say I blame Tommy ... I might be just as protective of my lady with the collection of mixed nuts out there. Fame and fortune comes with it's share of problems. But for what ever their personal reasons, their marriage didn't last. Now, Mariah seems to be very publicly enjoying her new single status. And in this latest album, "Butterfly", she is having a ball. The Hip Hop beats she has stirred into this effort shows her love of the medium. Her vocals are what I like to call Liquid: very feminine and expressive. Mariah has just recorded music with Whitney Houston, proving that two divas can not only co-exist, but can work together. Who knows who was at fault for the split of her marriage, but Tommy might be eligible for the "David Justice Hall of Ex-Husband Fame" if he let her get away out of neglect on his part. 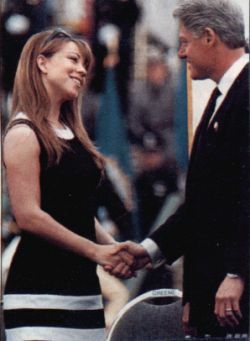 "Careful Mariah, watch his hands!"